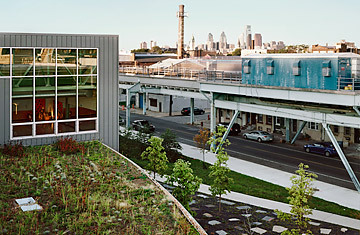 The view from the green roof atop the Kensington Creative and Performing arts High School in Philadelphia, September 16, 2011. Infrastructure is a boring word, spending has become a dirty word, and Congress has worried more about the $14 trillion national debt than the 9% unemployment rate. Last fall, when President Obama proposed to spend $50 billion to rebuild "roads, rails and runways," GOP leaders blasted his plan as a tax-and-spend boondoggle. But now that Obama has proposed a new jobs plan that includes major upgrades to crumbling schools and rickety bridges, and lawmakers are finding their approval ratings even lower than the President's, infrastructure may be back on the agenda. The U.S. Chamber of Commerce and the AFL-CIO, two groups that couldn't agree on the color of concrete, have both endorsed Obama's push for public works. The cost of borrowing is at a historic low, and a global economy demands new efficiencies at home, like high-speed rail. Even Republican leaders have expressed sympathy for the idea of getting America's house in order. "Infrastructure investments is an area where we should work together," House majority leader Eric Cantor tweeted after Obama's Sept. 8 jobs speech. The challenge is to do more with less: to rebuild America in a way that is smarter, greener and cheaper for taxpayers. That means focusing more on technology and less on asphalt, more on government policies and less on government projects, more on national priorities and less on sprawling pork-barrel roads and bridges to nowhere. Why build billion-dollar lock expansions to relieve barge congestion on the Mississippi River when better scheduling and peak-hour pricing could solve most of the problem at virtually no cost? Before adding lanes to clogged highways, employers and states could encourage telecommuting, carpooling and mass transit to take cars off the road. Or freight-rail improvements to take trucks off the road. Or computerized traffic management to steer drivers away from jams. Or zoning changes to allow denser housing near job centers and train stations. Such a change of thinking requires a creative approach to the laws of supply and demand, with a goal of reducing demand (for landfills, power plants, jails, even sewers) before adding supply. "Reduce, reuse, recycle" once sounded like a granola eco-mantra, but as landfills overflow, it's sounding more like sensible waste-management policy. "We're making decisions today that we'll live with for 50 years," says Peter Binney, a Colorado engineer who led an effort for the American Society of Civil Engineers (ASCE) to rate public works according to sustainability. "We can't keep doing things the way we always have." A smarter approach to America's infrastructure crisis is brewing underneath Philadelphia, where an aging "combined sewer system" that collects wastewater and storm water in the same pipes dumps raw sewage into the Schuylkill and Delaware rivers during heavy rains. Engineers have proposed a $9 billion storage tunnel under the Delaware to stop overflows and comply with EPA regulations. But Mayor Michael Nutter doesn't have $9 billion, and if he did, he wouldn't want to bury it 150 ft. underground. Read "Are Minorities Being Fleeced by the Stimulus?"